The first weekend of October, I was in Pittsburgh for the 39th National Convention of the FFRF. Part of that was a group tour of Fallingwater; I did not get around to posting a Flickr album of the trip for a variety of (bad) reasons. There was a lot of noise and I suspect the UV filter there. In many images, I used a slight Gaussian blur and then applied Smart Sharpen. All in all, I’m rather happy with how the pictures turned out. You can view the Flickr album here. Most of the pictures are from Fallingwater, but I did take some while walking around Pittsburgh. 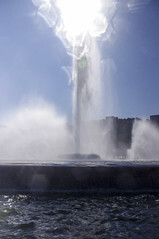 I loved the fountain at the tip of Point State Park. In this shot, I think I got really lucky. I thought it would look cool with the sun immediately behind the spray. But there was a huge risk of getting completely blown out. That didn’t happen though and the shot works. Just the same, I should probably invest in a neutral gradient filter sometime in the near future. 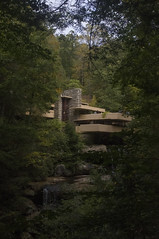 But Fallingwater is nothing less than breath-taking! You are not permitted to take photos during the tour itself. That’s why everything I have is exterior shots. I understand the rationale behind that rule; but it is still disappointing that I could not fully chronicle my visit there. I’ll definitely have to return sometime to get more shots from this magical place. A shout-out must be given to Adobe Photoshop and the Content-Aware Fill technology. Fallingwater keeps a steady flow of tourists through the house, so there is always going to be people on the cantilevered balconies. But I removed a few strong distractions with the Spot Healing brush and Content-Aware. Amazing results! I am looking forward to some photowalk opportunities around Etobicoke soon. A camera and kit upgrade may also be in my future – we’lll see!